As a Certified Speaking Professional (CSP), Mike is a leading expert on courage, dignity and integrity. Mike’ mission is to create a world where we all know we are valuable and worthy. 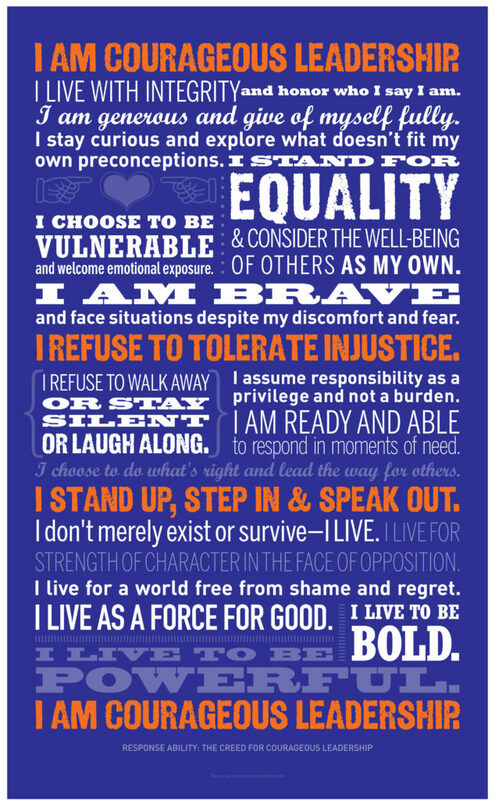 He empowers students to stand up, step in, and speak out for what’s right — to show courage. He empowers students to focus on building others up rather than tearing them down — to honor dignity. He empowers students to do what they say they will do and to honor their word — to act with integrity…no matter what! Mike is leading social movements to equip students with the strengths and actions necessary to make a positive impact on campus and personal issues by showing courageous leadership, honoring the dignity of others, and acting with integrity. Mike stresses the importance of standing up, stepping in and speaking out based on your values and core commitments to seize an opportunity to act and dramatically change the campus community and allow all of us to make the difference we want to make. He stresses the importance of building others up rather than tearing them down – honoring dignity. He stresses the importance of acting with integrity and honoring your word – no matter what. In his interactive keynotes and workshops, he equips students with easily digestible knowledge and actions to challenge the negative behaviors they see around them every day—and to inspire others to do the same. Mike’s programs have been used on over 500 campuses, in the programming for nearly 50 NIC/NPC/PFA groups, and have won awards within the higher education community (2009 Laurel Wreath from NIC, 2009 Fellow from FEA, and 2012 Excellence in Educational Programming Award from AFA) as well as the International Telly Award. Mike is not a therapist. He’s not a psychologist. He’s not an academician. He’s a filmmaker-turned-advocate who works with people to show courageous leadership, honor the dignity of every human, and operate with integrity. He is just a real human being leading real conversations designed to inspire us, empower us, and move us to action. As a filmmaker and video producer for over 30 years, Mike produced a film in 2008 that would change the course of his career — and his life. RESPONSE ABILITY: A Call for Courageous Leadership, the award-winning educational program on bystander intervention for 40 organizations and over 300 college campuses, immediately became a distinct and special project. This one struck a chord. This one caused a demand. This one sparked a movement. 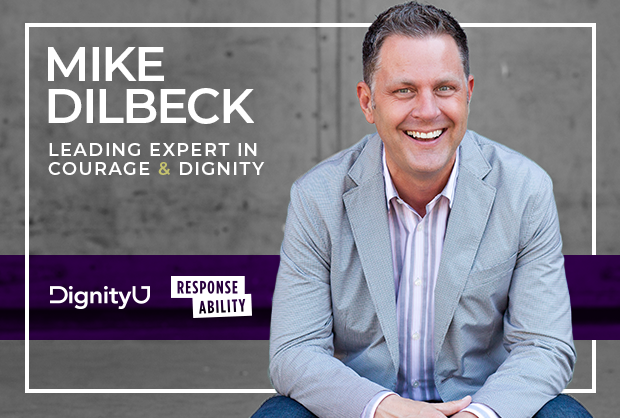 After 12 years of leading this movement for bystander empowerment — and personally surviving two types of cancer — Mike launched a new project in 2018: DignityU. Here, Mike educates and empowers us all to make the choice in every interaction to build someone up rather than tear them down. To honor dignity — our inherent birthright to feel valuable and worthy. At the request of a client — the American Cancer Society — Mike recently created a new program on integrity. After delivering this powerful keynote at their national leadership summit, he was struck by the extraordinary opportunity of defining and empowering others around the virtue of integrity — honoring our word…no matter what. The reasons why these three conversations are so critical have showed up in each of the nearly 4,000 stories he has accumulated from his keynote audiences. Each story is heartbreaking. Each story is filled with the shame and regret from not intervening in a moment of need or having our dignity violated. Each story points to the pain we carry with us for the rest of our lives…pain that determines whether we will ever stick our neck out again and show courage or honor dignity. The impact of someone not keeping their promises or honoring their word. Pain that impacts our own confidence and self-esteem. Now, as a filmmaker-turned-advocate, Mike delivers hope for a new world through these three movements. He speaks frequently for organizations, campuses, companies and communities — delivering his powerful, yet challenging, keynotes to audiences of all sizes. When not speaking, he is writing, training others, or creating the next big thing. In 2015, Mike was designated a Certified Speaking Professional (CSP) by the National Speakers Association. The CSP is the speaking profession’s international measure of professional platform competence. He now coaches others who aspire to elevate their speaking skills and competence in their own lives. When each of us is born, our glass of dignity is full. As kids, we are full of joy and full of confidence. We know ourselves as valuable and worthy. There is nothing we can’t or won’t do. We all come into the world equally valuable and worthy — and equally invaluable for our uniqueness. Regardless of background and capabilities, we share an innate need to be valued, acknowledged, listened to, treated fairly, and accepted for who we are. When we are not valued as such, we feel anger and frustration, often lashing out in exactly the wrong way to achieve the very thing we need and crave. Many of the world’s ills are rooted in this disconnect between what we need, what we do, and what we get in return. As we confront inappropriate, abusive, and even violent behaviors on our campuses, in our communities, and in our society, there is always a violation of someone’s dignity at play — someone is left feeling less valuable and less worthy as a result. Each time, their glass of dignity is a little less full — they have less life, less joy, and less confidence. 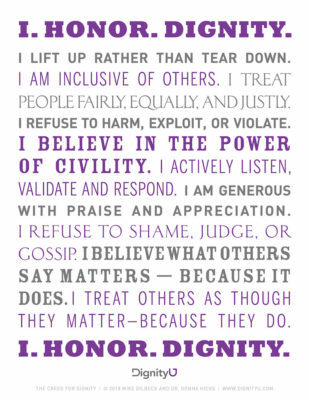 In every interaction, we have the choice to honor or violate someone’s dignity. We have the choice to lift someone up or tear someone down. We have the choice to empty or fill their glass. When dignity is honored, hazing is not an option. When dignity is honored, sexual violence is not an option. When dignity is honored, shaming is not an option. 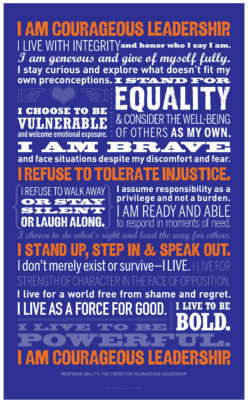 It is time to educate and empower ourselves — and others — to always make the choice of honoring dignity. So will you lift someone up or tear someone down? The choice is yours. 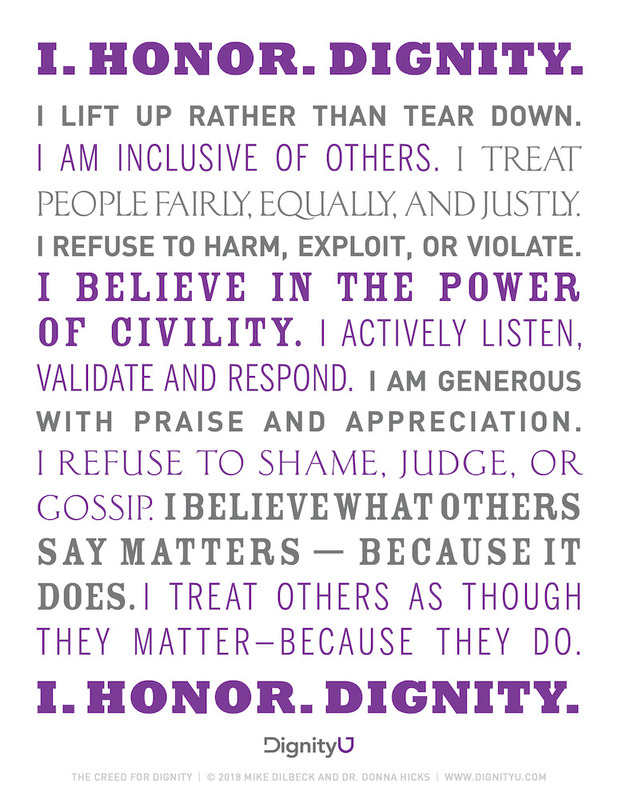 how to describe how dignity impacts their daily thoughts and actions. how to distinguish the essential elements of dignity. how toidentify ways the elements of dignity are violated. how to recognize the difference they can make for others by honoring their dignity. Courage is not just something to show — it’s a way of being. When we more past our fears and shame to take actions for others in critical moments of need and for what is right, we are being courageous. In this galvanizing keynote, Mike reveals the nature of being a bystander and the barriers many of us feel when we consider whether or not to act — those that get in the way of showing courage for other people, organizations and issues. Students from all walks of life will then understand how seizing the opportunity to act can dramatically change their campus, and how it can allow them to make the difference they already want to make. Mike concentrates on giving his audience three approaches to use whenever they see unhealthy or negative behavior among their peers, in their classes, on their campuses and in their lives. With “A Creed for Courage,” serving as the blueprint from the beginning of the keynote, Mike engages the audience and reveals how we all participate in bystander behavior. He also emphasizes how our commitments and actions go beyond the campus, and students will be equipped to deal with problems as they see them happening around them. RESPONSE ABILITY: A Call for Courage, is appropriate for all student groups, and it has been especially popular for fraternity and sorority leadership training. Consider it also for residence life training, student-athletes, emerging leaders events, peer education groups, wellness programs and more. This is our opportunity to empower the 80 percent of students who make the right choices. It’s time for them to stand up, step in and speak out when they see the other 20 percent making choices that bring down their communities. Before the audience leaves, they are given the opportunity to recite the Creed and join the movement to receive ongoing materials to support them in showing courage throughout their lives. how to gain the social awareness and personal power to intervene in problem situations and show courage. Just like the spokes of a wheel allow workability in the design of a bicycle, so does integrity in all areas of an organization, in life, and at work. When you do what you said you will do by when you said you will do it, this is integrity. When you do what others expect you to do, even if they haven’t said they expect it, this is integrity. When you honor your word, this is integrity. Integrity is not morality. Integrity is not good, bad, right, or wrong. Integrity is not grey — it is black and white. You either have integrity or you don’t. When you bring integrity, there is workability. Relationships work. Organizations work. In this insightful and impactful keynote, Mike empowers us to operate with integrity…no matter what. Mike first defines integrity in a new and refreshing, yet sometimes challenging, way. Whatever you may think integrity is, Mike may very well redefine it for you. He then illustrates integrity by using the metaphor of a bicycle wheel — that such a wheel cannot work the way it’s designed unless each spoke of the wheel is trued up perfectly. Said a different way, each spoke requires integrity to truly work and function in a smooth, efficient, and direct way. Mike then takes three areas of an organization, community, or just life in general, and creates for your audience what it looks like to bring integrity to these spokes of your wheel. Mike will work with you directly to determine what these three spokes will be – customized to the needs of your community or organization. To put a touch of “WOW!” into the keynote, Mike rides to and from the stage on a bicycle* to the music of Queen. No kidding! This keynote is a powerful and effective way to create and nurture a culture of integrity in your organization or community — resulting in a higher degree of trust, increased productivity, and maximum workability. It also teaches one of the most, if not the most, essential skills of living life powerfully for each audience member. *Based on availability of bike and appropriate venue. how to know yourself as someone who acts with integrity – no matter what.